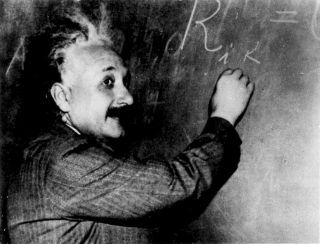 Famed physicist Albert Einstein at the blackboard. Albert Einstein's theory of special relativity revolutionized science and, once proven observationally, brought the physicist international fame. Though some observers dismiss much of the science that came before him, Einstein relied upon older work to formulate his landmark theory, experts say. "The standard account of relativity tends to say that before Einstein, there was darkness … and then Einstein brought light," Dan Siegel, of the University of Wisconsin-Madison, told reporters last month at a meeting of the American Physical Society in Savannah, Georgia. By the end of his lifetime, "admiration of him as a person and celebrity inhibited a critical analysis of his unified field theories," Paul Halpern, of the University of the Sciences in Philadelphia, said at the same conference. In the 25 years preceding the publication of Einstein's theory of special relativity, his predecessors made great strides in the sciences that provided its foundation. "Einstein's predecessors were some pretty clever people," Siegel said. "They made some good progress on the concepts that would develop into relativity theory." In this time period, an era Siegel dubs "protorelativity," ideas were more concrete and pictorial than Einstein's more abstract concepts, a fact that Siegel believes can help more people outside the field of physics understand how relativity works. Students can learn these concepts in introductory physics classes, rather than waiting for graduate school. Relativity describes three significant phenomena: At relativistic (near-light) speeds, length begins to contract, mass increases and time moves more slowly. According to Siegel, the protorelativity crowd receives "full credit" on length contraction and half credit on the increasing mass. On the more complicated subject of time dilation, they receive only minimal credit. Overall, the protorelativity scientists received "1.5 out of 3" potential marks. "They're sort of halfway there on the relativistic effects," Siegel said. One example comes from the Michelson-Morley experiment, which is now taught in most high school physics classes. Performed in 1887, the experiment sought to measure how light slowed as it traveled through a substance known as "luminiferous ether," which was then thought to fill space. The experiment failed, though it did precisely measure the speed of light. To explain the failure, scientists determined that moving objects such as light contracted along their length. Knowing that electrical forces exist within a moving meter stick, and relying on the recently determined Maxwell equations to calculate electric and magnetic fields, scientists devised a formula for length contraction — a formula still used today to measure length contraction in relativity. "By using Maxwellian electromagnetic theory, they were able to get what we now regard as a relativistic result," Siegel said. According to Siegel, protorelativity was not wrong as much as it was bulky and awkward. For instance, in order to determine the results created by increasing mass, scientists theorized that electrons deform as they move. (They don't.) The sheer messiness of such theories helped motivate Einstein to generate his work, Siegel said. While the scientists who came before Albert Einstein provided a significant foundation for the famous scientist's relativistic theories, Siegel emphasized that these researchers didn't come close to applying the same logic Einstein used. "That was Einstein's accomplishment," Siegel said. Does the idea of a strong foundation dilute Einstein's importance, or cast doubt on his genius? Siegel says no, pointing to Isaac Newton's quote: "If I have seen farther, it is by standing on the shoulders of giants." "Giving more attention to the protorelativity period heightens Einstein's accomplishments," Siegel said. "If his predecessors were some of the smartest people, and Einstein went far beyond them, I think that's saying more in favor of Einstein." Einstein published his theory of special relativity in 1905 and his theory of general relativity in 1916. But the famous scientist wasn't content to rest on his laurels afterwards. "When the ink was barely dry on his masterful theory, Einstein began to look further," Halpern said. In 1929, the scientist published his theory of distant parallelism, which modified general relativity. By adding a component known as tetrads to the space-time surface, Einstein made it possible to define parallel lines independently between two distant points in space. The physicist defined tetrads by equations that turned out to be proportional to Maxwell's electromagnetic equations, allowing general relativity to describe both electromagnetism and gravity. "Einstein did this mathematically by altering his own theory, but in a way that made his own theory less elegant," Halpern said. The press received the new theory with greater enthusiasm than did the physics community. Ironically, this reversed Einstein's status prior to the 1919 experimental confirmation of general relativity, when the public generally ignored him while physicists respected him. Einstein's split from the physics community was due in part to his public rejection of the new theory of quantum mechanics. Because of this position, few scientists in the field kept up with Einstein's latest work. "Most physicists were starting to think of Einstein as a relic," Halpern said. The scientist remained famous in the popular imagination, however. Several stories were published each time he announced a new theory, even when Einstein specified that it was still a work in progress. One article in The New York Times extolled the new theory of distant parallelism as "by far his most important contribution to mankind, scientifically more important than his original theory." By 1931, however, Einstein had given up on this theory, moving on to others that continued to garner accolades from the press. Part of the attention stemmed from Einstein's enthusiasm in sharing the information. He issued a press release in Berlin about his new theory, to some extent advertising it as a theory of everything, according to Halpern. The physicist also sought to bring attention to himself for his political causes. Einstein quickly learned that the media was eager to discuss not only the information he wanted to share, but also that which he wished to keep private. "He was not interested in attention to his day-to-day life," Halpern said. To celebrate his 50th birthday in 1929, Einstein fled to a villa in Berlin, making an effort to tell no one where he was. But a reporter found and photographed the scientist's birthday celebration. "He couldn't quite get the privacy that he wanted," Halpern said. When asked, Halpern drew parallels between Einstein and today's noted physicist Stephen Hawking, of the University of Cambridge. "I do think that sometimes [Hawking] will make a statement, and sometimes his statements are misinterpreted or taken to [the] extreme," Halpern said, stressing his great respect for the British scientist. Halpern pointed to recent reports by the press that Hawking no longer believes black holes exist, calling such headlines "really a stretch." Overall, however, Halpern thinks that the media today is far less likely to overhype material, though he notes that it does sometimes happen. As an explanation, he points to a greater knowledge of scientific fact and the scientific method today than existed almost 100 years ago. "Sometimes when things are hyped, you also see some critical comment in the media," he said. Einstein never found his sought-after theory of everything. Scientists are still searching for it today, having developed several contenders, including string theory.